A new State Department report is further evidence of a lack of U.S. policy for the region. If the State Department’s recent “Country Report on Terrorism” confirms anything, it is the lack of import Central Asia maintains in D.C.’s policy circles. The region comes across as something of an afterthought in the write-up, especially in comparison to the South Asian analyses contained in the same report. Considering Washington’s current policies in the region – or lack thereof – perhaps this shouldn’t come as much of a surprise. Nonetheless, a few trends and tidbits within the report are worth noting. For instance, as EurasiaNet’s Joshua Kucera noted, prior skepticism about terror threats in Central Asia are “less apparent in this report’s newly written sections on ISIS.” Indeed, ISIS is mentioned in the context of all nations, except Turkmenistan, both in terms of recruiting practices and governmental responses. Central Asian governments have been more than eager to play up threats from ISIS – which Washington has been happy to oblige in certain instances – but the report doesn’t contain much new information on either presence or governmental restriction. For some reason, Kazakhstan, despite mirroring many of the policies of its Central Asian neighbors, escaped any notable criticism in the report. Rather, the report praised Astana’s enhanced policies: “In the past, law enforcement bodies were criticized for killing rather than capturing members of suspected terrorist groups, but over the past several years have shown a greater tendency to arrest, detain, and question suspects. 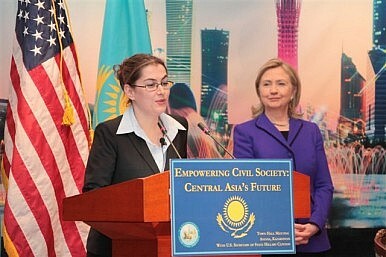 Security forces, including military and law enforcement, are undergoing a process of professionalization and reform with the goal of more effectively discharging their duties.” While the efficacy of such reforms remains to be seen, the lack of notable criticism, despite ample scope for it, stands – perhaps one more indication of the lack of import D.C. brings to Central Asian analysis. The Trump administration’s sanctions hardball puts New Delhi in a tight spot.